The Brimhall model has 3 Beds and 2 Baths. This 1188 square foot Double Wide home is available for delivery in Oregon, Washington, Northern California, Northern Idaho. The masterfully crafted Brimhall is an architectural gem! Every room is thoughtfully built with the homeowner in mind. At the center of this trendy split floor, you’ll find a large living room with recessed entry and art niche. The island kitchen features a pantry, desk and all the latest appliances! The bedrooms are well-proportioned and feature a walk-in closet with double shelf. 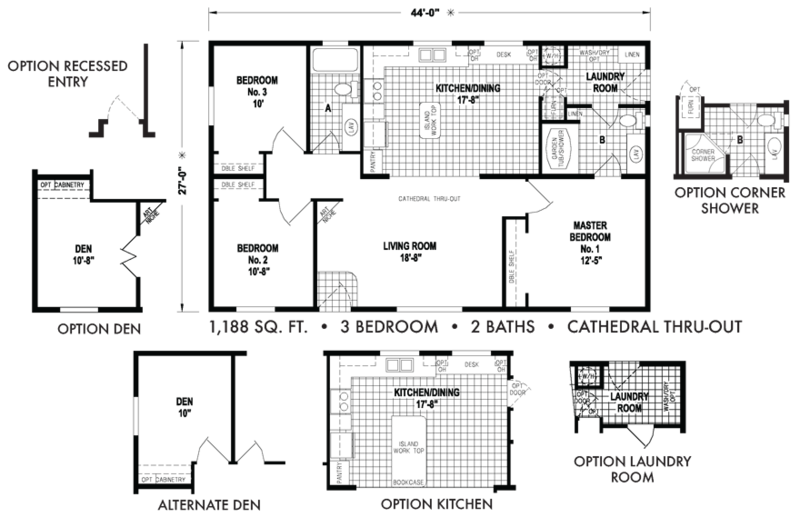 Ask about the alternate laundry/master bath layouts. Ask your housing consultant about the other great features that come standard on the Brimhall manufactured home.